NH's Largest Nonprofits – We list NH's top nonprofits and foundations, and delve into the roles they play in our economy and social fabric. Frisbie Gets a Shot of Energy – New hospital leadership and new programs will increase services to the community. Mobile Banking: Paying for the Perks – A look at how banks fund necessary technology investments. 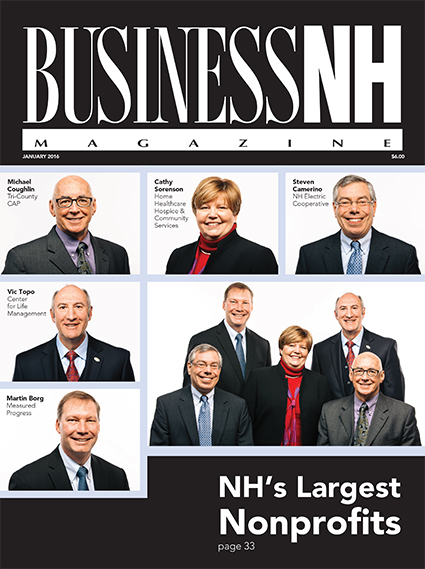 NH's Business Makeover – Recent legislation aims to attract companies to NH and help them grow. New Laws that Will Affect How You do Business – A review of changes to banking, securities and business tax laws in NH.